It's almost the end of the school year and Room Nine is taking a field trip to a farm, where the children can see a real barn, an actual farmer, and live animals. But Junie B. wants to know, Where's the gift shop? Surely no one would want her to go home empty-handed! From the Back Cover The world's funniest kindergartner is back in -- E-I-E-I-O! It's almost the end of the year, and Room Nine is taking a field trip to a farm! There's lots of fun farm stuff there. Like a real actual barn. And a real actual farmer. There's even real alive animals you can pet! Only, where's the gift shop? That's what Junie B. Jones would like to know. 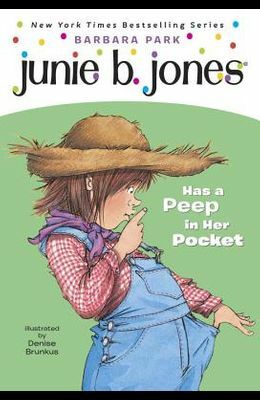 Surely no one would want Junie B. to go home empty-handed... Don't miss the other Junie B. Jones books. From the front Cover The world's funniest kindergartner is back, in her 15th book! It's almost the end of the school year, and Room Nine is taking a field trip to a farm! There's lots of fun farm stuff there. Like a real actual barn. And a real actual farmer. There's even real alive animals you can pet! Only, where's the gift shop? That's what Junie B. Jones would like to know. Surely no one would want Junie B. to go home empty-handed. . . .